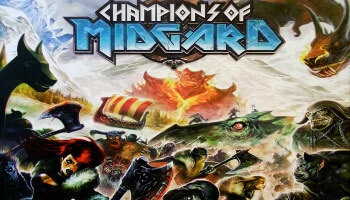 Champions of Midgard (formerly Defenders of Nidaros) is a middleweight, Viking-themed, worker placement game with dice rolling in which players are leaders of Viking clans who have traveled to an embattled Viking harbor town to help defend it against the threat of trolls, draugr, and other mythological Norse beasts. Resources are used to carve runes, build ships, and feed your followers. Viking warriors (custom dice) do battle with the myriad enemies the town faces. Without strong leadership, his prosperous port has fallen into a state of catastrophe. Fearsome creatures have sensed this weakness in Midgard and are coming in droves, driving chaos and destruction before them. Trolls attack the town. Draugr terrorize nearby villages. Monsters strike at travelers and merchants alike. The people are suffering and they need a champion. Market Stall tiles function just like other board locations but provide different options for each game. Market Stalls may only be activated once per placement unless otherwise indicated. Return 1 Food to the supply and collect 1 Favor. You may repeat this action up to 3 times with a single activation. Collect 1 Food and 1 Wood from the supply. Collect 2 Coins from the supply. All Quiet - No Effect. Kraken - Resolve Combat against the Kraken. Defeating the Kraken grants the player 3 glory. Surviving Warriors advance to combat the Monster. Lost - Lose 2 items of your choice (2 Food, 2 Viking Warriors, or 1 of each). No Wind - Lose 1 Food. Storm - Lose 1 Food or 1 Viking Warrior (your choice). Whirlpool - Lose 1 Viking Warrior.